Queqiao, also known initially as Chang'e 4 Relay, is a Chinese relay satellite mission in support of the Chang'e 4 rover landing on the far site on the moon. The 425 kg relay satellite is based on the three-axis stabilized CAST-100 small satellite bus featuring an 130 N hydrazine propulsion system. It carries a deployable 4.2 m dish antenna for the relay equipment. It provides four 256 kBps X-band links between itself and the lander/rover and one 2 MBps S-band link towards earth. 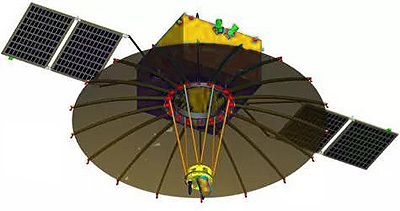 Besides the relay function, the spacecraft also carries the Dutch NCLE Low-frequency radio detector to provide radio-sky images, and frequency dependence of radio in the very low frequency band and to perform low-frequency radio astronomical observations. The mission is to be launched in 2018 on a CZ-4C rocket about 6 month in advance of the Chang'e 4 lander and rover. Via a lunar fly-by, it will be put into an halo orbit around the Earth-Moon L2 Lagrange point. It has a planned live of more than five years to support further far-side missions.